COLUMN: Forget the guy in red. It's Fiona's first Christmas! Lots of creatures were stirring. Especially two. Fiona had heard kids tell stories that day. She had questions about Santa and some kind of sleigh. What’s the talk about fat guys flying through snow? Delivering goodies to good girls and boys. Fiona asked questions her hippo mom feared. “Look, you already got stuff -- a book and a song . Bibi had answers her girl didn’t like. Bibi said, “Baby, you’re a big super star. That made sense to Fiona. She did not need a thing. She had food and her mom -- and that guy’s diamond ring . 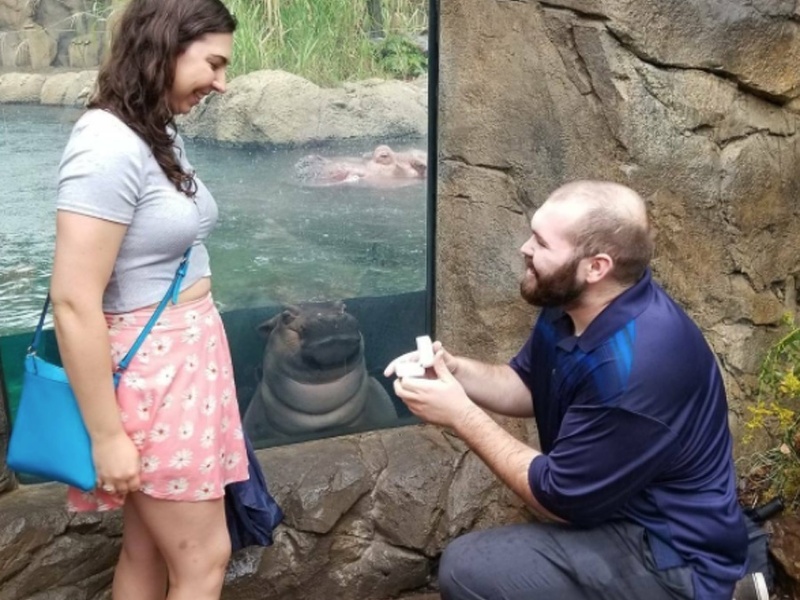 Remember when Fiona photobombed this guy's proposal? “The joy is in giving,” Bibi told her sweet girl. And stayed focused on giving her hippo-sized love. Even if sometimes she likes to eat poo. Lucy May writes about the people, places and issues that define our region – to celebrate what makes the Tri-State great and shine a spotlight on issues we need to address. She is the author of My Best Friend Fiona and has been a Fiona fanatic since the little hippo was born. To read more stories by Lucy, go to www.wcpo.com/may . To reach her, email lucy.may@wcpo.com. Follow her on Twitter @LucyMayCincy.